Choosing which paint is best for you begins with deciding if you need bulk paint or aerosol. Bulk paint looks great and affords you many options. 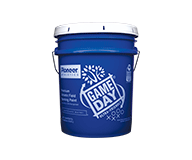 Pioneer Athletics offers several different bulk natural grass paints – from great paints that are more economical to super premium paints that may cost a few more dollars. This gives you several options to fit your budget. 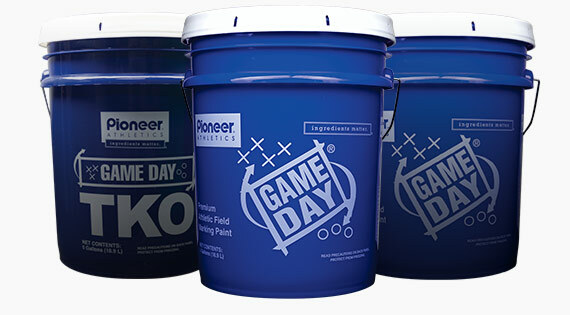 Additionally, Pioneer’s bulk grass paint brands each differ in their maximum dilution rates, allowing some paints to be diluted back further than others. For some customers, paints with greater dilution rates allow them to take a step up to a more premium paint. Another benefit of bulk paints is that in addition to a large pallet of standard colors, bulk paints can be ordered as any custom color. This gives you the ability to have logos with your school’s or organization’s exact colors. Things to keep in mind with bulk grass paints…. First, you need to make an investment into striping equipment. With machines you need to factor in maintenance, time to load the paint and clean up time. Another consideration to keep in mind is that bulk paint often needs to be mixed or diluted prior to using it. These factors need to be kept in mind because they affect the time and staffing needed. Aerosol paints are also very versatile. Aerosol cans work well in situations with limited staffing and time. Additionally, the prep work that goes into aerosol is pretty simple – shaking the can prior to use. Aerosol paints have a smaller startup cost compared to bulk paints because the machines are less expensive. An advantage of aerosol is that it can be used in inclement weather due to how quickly it dries. If you are a bulk paint user, having a few cases of aerosol on hand can help get you through those bad weather games. Although we offer many standard aerosol colors, custom colors are not an option. Bulk Paints – If you use one of our bulk paints, you’ll need to use a striping machine. Natural turf striping machines come in two varieties: Airless and low pressure. Low pressure machines apply field marking paint at approximately 45 psi. We recommend that low pressure machines only be used on natural grass athletic fields. There are a few different varieties of low pressure field stripers. Some models require you to pour your paint into a holding tank that is then pressurized by a canister of CO2. Other versions using the same holding tank utilize a pump that draws the paint out. There are also low pressure striping machines that draw paint directly from the bucket we send your paint in. 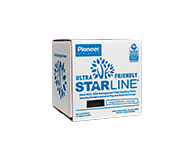 Finally, Pioneer offers a unique low pressure machine – our StarLiner – that utilizes plug-and-stripe technology. Boxes of our StarLine paint are attached to the machine and the paint is drawn out by a pump. Airless striping machines can be used on both natural grass and synthetic turf. These striping machines utilize high pressure to atomize the paint as it’s sprayed out. 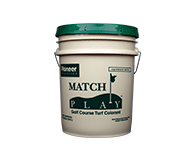 This allows the paint to fully encapsulate the turf blade – providing an even coat while using less paint. Many machines have a dial that allow you to choose how much pressure you want to use. When using an airless machine for painting natural grass, its common to set the dial anywhere from 800-100 psi. Pioneer sells numerous airless striping machines, including self-propelled models. Aerosol paints can be applied using a handful of methods. The most simple, but not necessarily the most comfortable, is simply spraying by hand. There are also three different tools that can help make using aerosol paints more manageable. The first is an aerosol can gun, a foot long apparatus that secures the can and uses a trigger system to make spraying the can easy. This tool works well when you are painting logos. The second is an aerosol marking stick, a 2.5’ stick that also secures the can and uses a trigger system. The marking stick can be used for both lines and logos. Finally, there are aerosol marking machines. These four-wheeled devices carry up to 12 cans of aerosol paint. 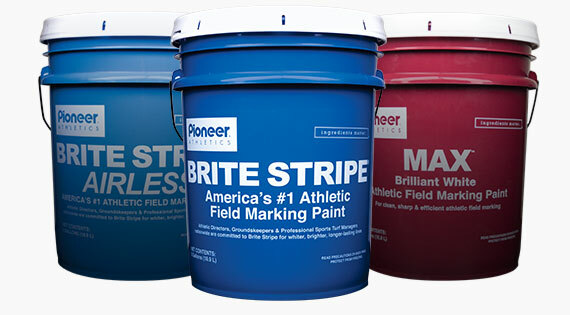 The aerosol marking machines give you the most control when you are marking lines on an athletic field. Pioneer sells each of these aerosol marking tools in two different sizes to correspond with our two different aerosol can sizes – standard and jumbo. Super Premium – These paints are our highest quality paints that will give you the most brilliant whites and stunning colors. Superior quality raw materials are used to make these paints. If your organization is extremely budget conscious, these may not be the best choice for you because they are also more expensive than some other options. 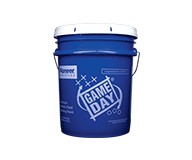 Although we have customers who use these paints exclusively, we also have customers who only use these paints on their game fields for special events, such as homecoming or playoff games. 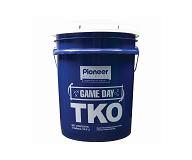 Pioneer super premium paints are Game Day and Game Day TKO. Premium – Our premium paints are our most popular. They are made of very good raw materials – giving you a quality product designed specifically for natural grass that also performs much better than our competition. If you are looking for bright whites and vivid colors that last a long time, can be diluted, and are more in line with your budgeting needs, then our premium paints are perfect for you. 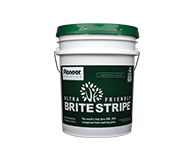 Pioneer’s premium bulk natural turf paints are MAX and Brite Stripe. Ultra-Friendly – We are proud to have created the world’s first No-VOC (volatile organic compound) athletic field marking paints. Although all our natural turf paints are not harmful to the living plant, our ultra-friendly paints are for those customers who want to take it a step further and be even more environmentally conscious. As an added bonus, the United States Environmental Protection Agency has recognized our white and blue ultra-friendly paints with their “Safer Choice” designation because of the environmentally preferable raw materials used. 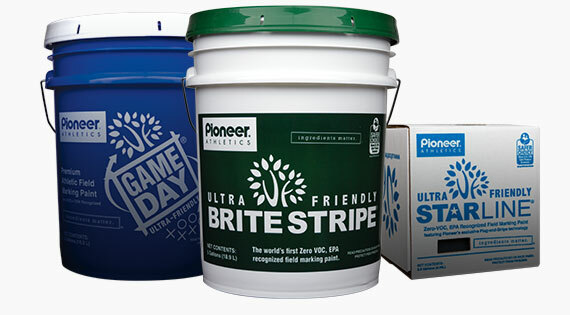 Our ultra-friendly paints are available as a super-premium GameDay Ultra-Friendly, premium quality Brite Stripe Ultra Friendly, and our unique bag –in-a-box StarLine Ultra-Friendly – designed specifically for our battery powered StarLiner striping machine. 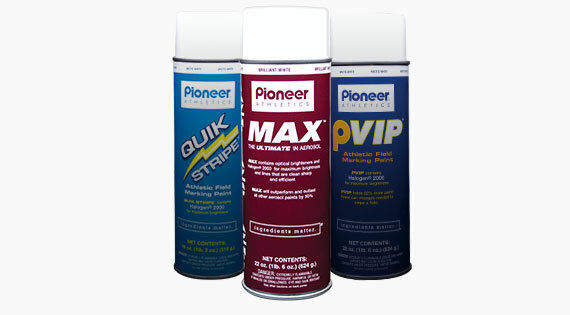 Aerosols – Pioneer offers three different aerosols in two different can sizes. Our top-of-the-line MAX Aerosol gives you the brightest whites and most brilliant colors of any athletic field marking aerosol in the industry. MAX aerosol is in our jumbo size can, giving you more paint per can. We also manufacture Quik Stipe, a premium aerosol in a standard size can that comes in 21 high-performance colors. If you are looking for a white paint that is similar to Quik Stipe but in our jumbo size can, we suggest purchasing PVIP. You may have noticed that some of our bulk natural turf paints come in versions with the word Airless or Pre-Mix in the name. These paints were created for those with more specific needs. Airless paints have a viscosity specifically formulated for superior performance with an airless striping machine. This doesn’t mean that you can’t use our other bulk paints in an airless striper. It just means that this paint performs the best with airless technology. Airless paints are meant to be sprayed as delivered; meaning that you shouldn’t dilute the paint any further in order to maintain its quality. 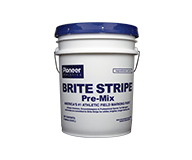 Pre-mix paints are designed for customers who prefer not to dilute concentrated grass paints. So, for these customers we pre-mix our paint. Just like our airless paints, pre-mix paints are meant to be sprayed as delivered – not diluted any further.